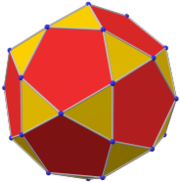 In geometry, the truncated dodecahedron is an Archimedean solid. It has 12 regular decagonal faces, 20 regular triangular faces, 60 vertices and 90 edges. This polyhedron can be formed from a dodecahedron by truncating (cutting off) the corners so the pentagon faces become decagons and the corners become triangles. It is used in the cell-transitive hyperbolic space-filling tessellation, the bitruncated icosahedral honeycomb. 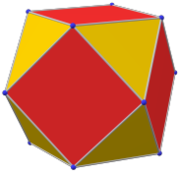 The truncated dodecahedron has five special orthogonal projections, centered, on a vertex, on two types of edges, and two types of faces: hexagonal and pentagonal. The last two correspond to the A2 and H2 Coxeter planes. The truncated dodecahedron can also be represented as a spherical tiling, and projected onto the plane via a stereographic projection. This projection is conformal, preserving angles but not areas or lengths. Straight lines on the sphere are projected as circular arcs on the plane. This polyhedron is topologically related as a part of sequence of uniform truncated polyhedra with vertex configurations (3.2n.2n), and [n,3] Coxeter group symmetry. In the mathematical field of graph theory, a truncated dodecahedral graph is the graph of vertices and edges of the truncated dodecahedron, one of the Archimedean solids. It has 60 vertices and 90 edges, and is a cubic Archimedean graph. Eric W. Weisstein, Truncated dodecahedron (Archimedean solid) at MathWorld. Weisstein, Eric W. "Truncated dodecahedral graph". MathWorld. Klitzing, Richard. "3D convex uniform polyhedra o3x5x - tid". This page was last edited on 2 April 2018, at 20:46 (UTC).